In May of 2017, a small piece of Houston history from the 1920’s reopened to the public as Retrospect Coffee Bar. 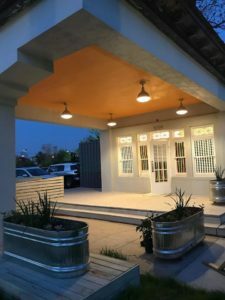 The little structure (297 square feet to be exact) that began life as one of the city’s first neighborhood gas stations, is now serving up lattes, crepes and craft beers at the corner of La Branch and Alabama, directly across from the Houston Community College’s central campus. 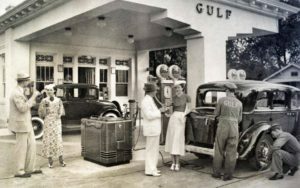 When it first opened in in 1921, the gas station was notable as the site of Houston’s first “Kelvinator”, a great advancement in technology that allowed customers to purchase a cold drink while they refueled. For the next 50 years, the station proudly served the community of the Greater Third Ward. But by the 1970’s, as the neighborhood gas station was eclipsed by full-service convenience stores on major thoroughfares and highways, the little station fell into disrepair. In the summer of 2017, after a three-year renovation process, we were excited to finally share Retrospect with our neighbors. 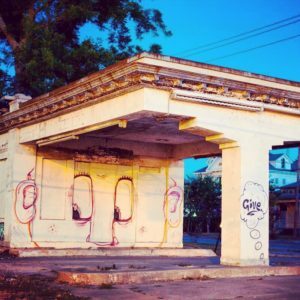 It was a labor of love to bring this concept forward, but frankly we – nor the architects, the engineers, the contractors, or even the city — had any idea that a derelict little gas station like this would present so many construction challenges! We worked hard to return the structure to its original beauty, while also meeting current city codes. A lot had changed in ninety six years! Throughout the renovation process we made a concerted effort to incorporate sustainable and energy efficient materials in the building. We connected an old shipping container to the station for the bathrooms and prep area. Wood from the roof was used for the hallway between the two structures. All of the windows were removed and sent to a local carpenter to be refurbished. Outside, we installed a rainwater collection system and Truegrid pavers that absorb 100% of the rain with with zero runoff. We hope that we’ve contributed to the quality of the neighborhood with an environment that is unique, relaxed, and friendly. We hope to see you soon!